The children's section at your local library is a magical place for kids to play, interact with each other through reading, and discover endless enchanting stories on shelves. If you haven't yet taken your child to the library, or don't go as much as you'd like, read more about why the library is an important place to help expand your child's world and imagination. We'll also share a few hints to maximize your library experience. • Fosters literacy. The library is an excellent introduction to books and provides an exciting environment for reading. Trips to the local library put an emphasis on reading as an exploration. With a sea of selections, even the most reluctant of readers are bound to find and fall in love with a book. • Offers a quiet space. Though it can be an exciting environment for young kids, the library also has plenty of quiet nooks to do homework if this kind of setting is not available at home. Plus, it has loads of resources for school projects or personal projects. • Creates a sense of eagerness in a child's willingness to read and learn. Children will want to finish their book so they can go back to the library and check out another. • Helps develop an appreciation for print books. Seeing thousands of books organized on shelves is enough to marvel at, but just wait until your child opens up an actual book and dives into the pages! It's important for your child to be able to touch and feel the book they're experiencing. Developing an appreciation for print books is also a wise decision in steering your child away from staring at electronic screens. • Teaches your child how to share. Your child will learn how to borrow items and treat those items with the same respect they would treat their own. They're also likely to engage and interact with other children at the library. • Associates reading with leisure and pleasure instead of (possible) frustration with school or homework. The library is a wonderful place to read without all the pressure. • Is affordable. Borrowing books at the library is an effective way to spend your time and your money. If the cost of books is something you worry about, make the trip to your local library a family outing. • Get your child a library card (even if they're a toddler!). Children love to play with Mom and Dad's credit cards, so why not grant them access to the bookshelf and let them have a library card all to themself? Make a celebration out of it and officially initiate them into the ever-expanding world of books with their very own plastic! • Embrace your library as a community. See if your library hosts story time events, which are a great, interactive way to introduce young children to reading. You and your child can learn about books, rhymes, music, fairy tales, and do other fun activities. This can help with vocabulary and narrative skills. • Befriend the children's librarian. Most children's sections have librarians that specialize in children's books and resources, so don't be afraid to pick their brain. They'll be able to guide you toward great collections of classics and even overlooked books that you might not have discovered otherwise. • Look beyond the books. The majority of libraries also have DVDs, CDs, and more downloadable books and other materials available to borrow. 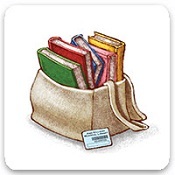 Use these items as reading rewards: for example let your child pick out one DVD for every two books read cover to cover. *These hints were inspired by Reading with Babies, Toddlers & Twos. We recommend this book for more library tips! The perfect introduction to library and literary loving! 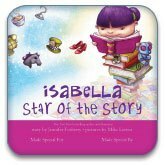 In this enthralling, literary adventure that takes place at the local library, your daughter will become the purple-haired, story-loving Isabella. She'll imagine flying as Peter Pan to the children's section of the library, chasing the white rabbit as Alice in hopes of an epic adventure, and twisting away to a Technicolor world as Dorothy. Your daughter will become the star of the story, while discovering that all she needs is a library card and a big imagination.